If you've ever woken up wondering, "What was that about?" this fascinating dream dictionary with over 12,000 definitions will explain everything and enable you to become your own dream expert. By exploring your dreams in a deeper way, you'll reach a profound understanding of what you really want in life – and work out how to achieve it. Whether you dream about flying above canyons, your teeth dropping out, missing the bus, or standing naked in a crowded room, psychologist and author Ian Wallace will help you understand what your unconscious is trying to tell you and how you can use your dreams to help you live a richer and more fulfilling life. By exploring your dreams in this practical way, you'll reach a deeper understanding of what you really want in life – and work out how to achieve it. How do I remember my dreams? What are symbols and where do they come from? Trying to find out what your dream means to you can often be a confusing and frustrating experience. Most dream interpretation sources offer a variety of meanings for a particular symbol. Although it can be interesting to explore the different viewpoints of Jung, Freud, the ancient Assyrians, and many other sources that offer dream insights, it often results in a situation where you end up spending most of your time trying to resolve contradictions between the various opinions. Using this dream dictionary is different. Instead of looking at all possible opinions, it is firmly based on taking constructive action. The symbol definitions are practical and a great way to ask yourself fundamental questions that will move you into specific action. These definitions have emerged from over thirty years of working with dreams and by consistently working with dreamers to help them identify opportunities that will lead to healthy and fulfilling outcomes. Rather than delving into the more esoteric aspects of working with dreams, this dream dictionary provides a practical method of understanding what your dreams actually mean, so you can put them into real action. A dream is how you naturally express a fundamental aspect of your self-­awareness. This fundamental awareness is your unconscious self and is quite simply all the areas of yourself you are not consciously aware of. Although these may seem to be of little consequence in waking life, most of your behaviors are driven by your unconscious self and all the information you absorb with it in every waking second. At the most basic level, we dream because it is a natural function that has evolved. Although some people who, due to a brain injury or a congenital condition, lack the neurophysiology to dream, everyone dreams. By using our dreams to make sense of all the information we have unconsciously absorbed, we can become far more successful in identifying valuable opportunities for personal development in waking life. Dreaming also contributes to our sense of physical well-being. If for any reason we are unable to engage in dreaming activity, we can experience a variety of unsettling physical symptoms. The human brain, however, is not just some wet organic computer that needs to be regularly decluttered and defragmented. Your brain is much more complex than the most powerful computer, and dreaming has evolved as a vital aspect of how you create your perceptions of the world around you. The unconscious awarenesses we use our dreams to make sense of are not just the events of the previous day but are drawn from the whole of our life experience. As we recollect and reconnect with these meaningful experiences, we project them into our future lives so we can naturally position ourselves for success and fulfillment. All humans are dreamers, dreaming of brighter futures. ©2015 Ian Wallace. All rights reserved. 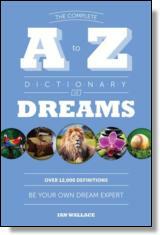 Reprinted from The Complete A to Z Dictionary of Dreams: Be Your Own Dream Expert. No part of this publication may be reproduced, stored in a retrieval system or transmitted in any form or by any means, without the written permission of the publisher. Publisher: Health Communications, Inc., 3201 SW 15th Street, Deerfield Beach, FL 33442. Ian Wallace (Edinburgh, Scotland), graduated with a degree in psychology, and has analyzed over 170,000 dreams for his clients during his professional career. Wallace is the originator of the Dream Connection Process, a unique and powerful method that enables anyone to connect the imagery and symbolism that they create in their dreams to situations and opportunities in waking life where they can use this awareness to make a healthy difference. Wallace regularly appears on television, on radio and in print, where is consistently applauded for his accuracy and his authority in analyzing dreams.